How do I show the icon in my Chrome toolbar? Note: This article assumes that you had the VirtualShield extension installed at one point. If you have never installed it, please install the extension now. If you did have it installed but don't know what happened, click here. Can't see the VirtualShield icon in your Chrome toolbar anymore? 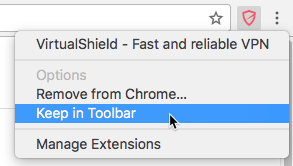 If you already enabled VirtualShield, but don't see the icon in your address bar, it's most likely "hidden" in the Chrome menu. This article will help you get it back. First, please make sure the VirutalShield Chrome Extension is both installed and enabled. For help installing it, click here. For help enabling it, click here. Look for the Menu icon (3 vertical dots) on the right of your address bar. Look for the VirtualShield icon, and right-click on it. Select the Keep in Toolbar option. That's it! The VirtualShield icon should now be in your Chrome browser, right next to the Address bar. 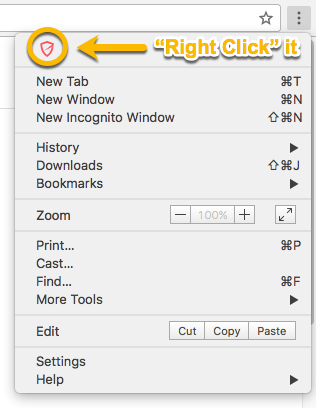 How do I disable the Chrome Extension?